Be a member, have your voice heard! Group discount programs for car rentals, magazine subscriptions, consumer loans, home mortgages, auto, life, and home insurance programs, etc. Benefits available exclusively to members. 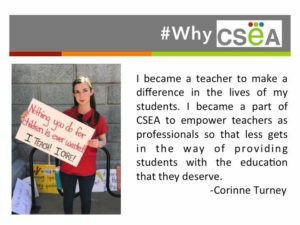 Visit the websites for CEA and NEA Member Benefits for information on these exclusive benefits. Additional benefits are provided exclusively to members using the links below. Members are eligible for two free 30-minute consultations on personal, legal issues during each membership year (September 1 through August 31).If you need help beyond this, our Attorney Referral Program (ARP) gives you legal assistance at rates well below participating attorneys’ usual fees. Many members are able to recover the entire cost of their annual CSEA, CEA and NEA dues by taking advantage of California Casualty’s highly competitive rates for automobile and home coverage. California Casualty’s Brian Sarratt is dedicated to providing CSEA members the most comprehensive coverage at the most favorable rates. The NEA Member Benefits program is committed to truly understanding and accommodating the personal and professional needs of our members. They offer a wide variety of insurance, credit, loan and mortage, investment, and consumer discount programs that are available exclusively to NEA members. CSEA members who take advantage of our CSEA Home Services Program will receive a rebate that offsets* their annual dues when buying or selling a home using program. The rebate applies whether the property is a primary residence or investment property. Contact Charlie Brown, RE/MAX Properties, Inc. at 719.226.3552 to learn more. *Details are also available here. Below is a list of websites provided to us by members who have found them useful. These sites are not endorsed by CSEA, but we believe that you will find them helpful.